Development of space systems and spacecraft, automatic and manned orbital stations in the interests of Ministry of Defense. 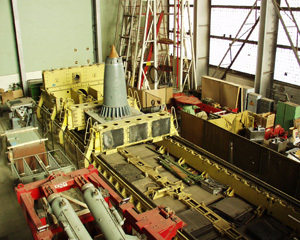 Development of missiles and rockets became a basic activity of the company, it started in 1944 under the leadership of Vladimir Nikolaevitch Chelomey, when a design bureau for flying bomb development was founded on the basis of Experimental Design Bureau at Aviation Factory No.51headed earlier by Mr. N.N. Polikarpov. Within the period from 1944 to 1953 the company's specialists designed, manufactured and carried out the flight trials of pilotless vehicles with pulsejet motors (10 Х , 12 Х , 14 Х , 16 Х ) to kill objects and targets located at long distance from air-borne platforms. This new weapon was deployed on aircraft Т u-2, Т u-4 and P е -8. 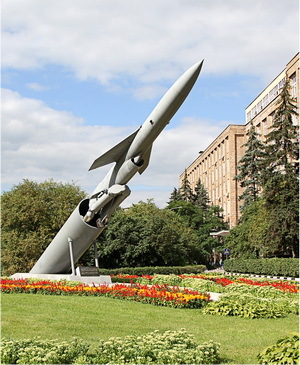 Then the projects for development of flying bombs were transferred under responsibility of Mikoyan Design Bureau, where they did not last long. In 1954 a Special Design Group was organized in Tushino at the site of factory No.500 under the leadership of V.N. Chelomey, and it got a task to put a ground-based flying bomb 10 ХН into commission. Specialists working in the Design Bureau in the period of 1944-1953 became a core of this group. However, not limiting himself by the frames of this work, V.N. Chelomey submitted proposal to the government to take a part in a tender for development and creation of the next generation weapons with strike cruise supersonic missiles to arm Naval submarines. The very essence of the proposal was to develop a weapon complex with a missile of innovative configuration and a turbine jet engine. A feature of the proposed missile design was its capability to be deployed with folded fins in a small pressurized cylindrical container inside a submarine. The missile would be launched from the same container after submarine coming to sea surface; the fins would unfold automatically and synchronously at the initial stage of flight just after missile exit out of the container. This novel idea brought victory tothe company in the contest. In 1955 the Special Design Bureau was re-organized and became the USSR Experimental Design Bureau No.52 and the staff was moved to the town of Reutov , Moscow region, to the site of a mechanical factory. Great efforts were taken to develop missile P-5. Sea-borne naval complexes (P-5, P-5 Д ) and ground-based ones ( С -5) with cruise missiles were developed and commissioned, to attack targets located at the sea shore, as well as deep in the enemy's territory. 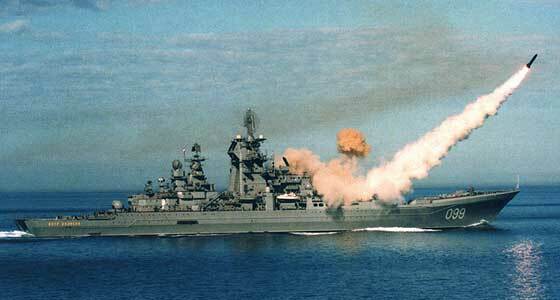 The national Navy was armed with advanced menacing weapon, and the Soviet Union received the means to deter American ambitions in the period of Cold War. The above experience enabled simultaneous designing and testing of P-6 and P-35 complexes with anti-ship homing cruise missiles, which had selective killing capabilities of enemy ships located over the radio horizon. Submarines of 644, 651, 665, 659, 675 and 644-D projects were armed with P-5, P-5D and P-6 complexes, P-35 complex and its derivative «Progress» were deployed on surface ships 58 («Grozny», «Admiral Golovko», «Admiral Fokin», «Varyag») and 1134 («Vice-Admiral Zozulya», «Vice-Admiral Drozd», «Sevastopol», «Vladivistok»), and on ground-based mobile and stationary complexes. In 1960-s the company developed missile weapon complexes with homing missiles launched under water. First such complex Ametist was commissioned to Navy in 1968. It was deployed on submarines of 661 and 670 projects. 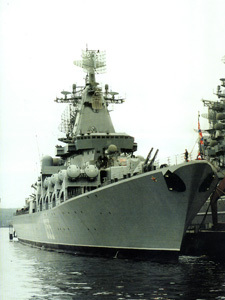 In subsequent years the company developed and commissioned to Navy the missile weapon complexes «Malakhit» and «Granit» with anti-ship homing cruise missiles fit for any platform (submarines or ships) and type of launch (underwater or surface) and meant to attack all classes of ships including large ones under intensive enemy counteraction. Complex Bazalt, which substituted P-6 system in 1970s, was deployed on submarines of 675 МК project, as well as on cruisers of 1164, 1143, 1143.4. In 1987 the missile weapon complex with upgraded anti-ship missiles Bazalt was commissioned to Navy. The complex was deployed on atomic submarines of 675 MKV project. According to governmental decree of 1987, these missiles armed missile cruisers of 1164 project including flagship of the Black Sea fleet, cruiser Moscow , and the atomic aircraft carrying cruiser of 1143.4 project. In 2002 the company commissioned its latest development to the Russian Navy-“Onix” weapon complex deployed on “Nakat” missile boat of 1234.7 project. Following upgrading of “Onix” weapon complex ensured commissioning of the mobile costal missile complex “Bastion” to the costal missile divisions in 2015, as well as putting “Onix” cruise missile complex into experimental combat operation as a part of the weaponry on the multipurpose atomic submarine “Severodvinsk”. Within the frames of programs for the advanced missile development the company undertakes efforts for upgrading “Onix” weapon complex. In 2015 the mobile shore-based missile complex “Bastion” was inducted into service to the Armed Forces of the Russian Federation. Development of the long-range missile weapon complexes for the Navy invoked creation of a global sea surveillance system, to provide target designation data about over-the-horizon targets to these weapon platforms, when the complexes were used against mobile sea-borne targets. Launch of Granit ASM from cruiser "Peter the Great"
It was supposed that sea surveillance satellites would be brought to the orbit by launch vehicles of medium class developed by the company. This launch vehicle was also to deliver to space the first in the world maneuvering satellite, which development and building were under way at the company. The launch vehicle was designated UR-200 and it had the launch weight about 140 t. On November 4, 1963 the first launch of the new rocket took place. Then 8 more successful launches followed, to validate high performance of the rocket and eminent capabilities of the staff. However, the overt launch of the rocket complex did not meet requirements of that time and its further development was terminated. In connection with wider circle of missions and augmentation of work scopes in the period of 1958-1962, some companies, namely GOS NII 642 (later FSUE «OKB«Vympel» and now FSUE «Motor» DB), OKB-23 (now DB «Salyut» GKNPTs named after Khrunichev), DB of factory № 301 (now NPO named after Lavochkin), along with special design bureaus at aviation factories in Dubna and Saratov were affiliated with the company. 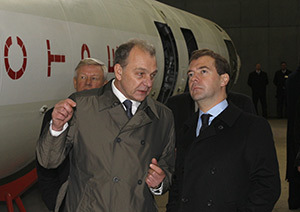 All this catalyzed development of state-of-art projects and programs and ensured their implementation on the highest level, since the specialists of these enterprises together with employees of design bureau OKB-52 introduced «the aviation approach» to the equipment development, which meant comprehensive tests of the vehicles on the ground before going to flight. To meet these great objectives, building of the largest design experimental and production center was started in 1960 in the company's territory along with construction of test facilities for ground tests of various vehicles. 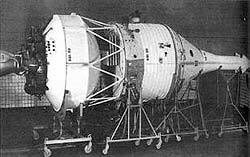 In 1963 the first in the world maneuvering satellite "Polyet-1"was launched. At the same time the company was developing a satellite system for the anti-satellite defense. Simultaneously with all above activities the company embarked on manned space programs in the interests of National Defense Ministry. First developments of manned spacecraft (space glider, rocket glider) demonstrated that to ensure full-scale, safe and efficient manned program, there was a need in a launch vehicle with the launch weight of 500 t., which would be capable to bring to the orbit about 15 tons of payload. This carrier designated UR-500 was also developed in 1960s. Within the period of 1965-1968, when the rocket underwent trials in two and three stage versions, four scientific stations “Proton” with weight varying from 12 to 17 tons were launched into space to do a research on particles of high and super high energy. with application of "Proton" LV. 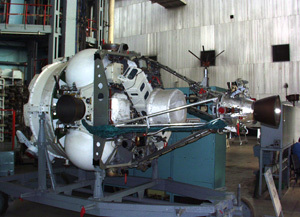 Advanced technical solutions implemented in rocket UR-500 inspired design bureau OKB-52 to venture upon development of a three stage launch-vehicle for the manned flight around the moon (project LK-1) and within the short time a heavy launch vehicle UR-500 К, later named “Proton”, was created. 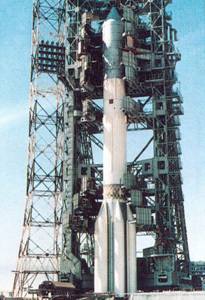 Later it was Proton LV which delivered to space the manned space stations of “Salute” family, as well as automatic stations “Almaz” , «Venus», «Zond», «Luna», «Mars», the basic platform and other modules of “Mir” complex, great number of telecommunication and military spacecraft and two main modules of International Space Station. Versatility of UR-200 and UR-500 enabled their usage not only as launch vehicles, but also as combat missiles with ballistic and so called “global” warheads starting from the orbit and capable to do maneuvers in atmosphere. 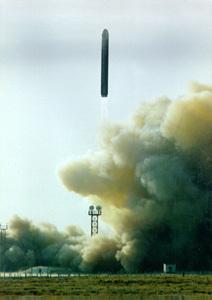 To validate technical solutions realized during designing of the orbital maneuvering warhead (projects АB-200 for IBM UR-200 and АB-500 for UR-500) the company created vehicle МP-1 maneuvering in atmosphere at high hypersonic speeds by means of aerodynamic controls, and it was successfully launched in 1961. Project UR-200 assembled at the company a group of experts in the field of rocket engineering, established a new type of cooperation between subcontractors and opened the way to master new technologies for intercontinental ballistic missiles of light class, but unlike UR-200, this rocket was deployed and launched from a silo. The experience gained from 1963 to 1967 allowed the company to develop and commission the missile complex with a canisterized intercontinental ballistic missile UR-100 of light class. By1970 about 1000 rockets UR-100 were put on combat duty and that provided the parity between strategic forces of our country and USA. Till the middle of 1980s the company developed and put into service several versions of missile complexes with IBM of this class (UR-100 К , UR-100 U , UR-100N, UR-100N UТТХ ). 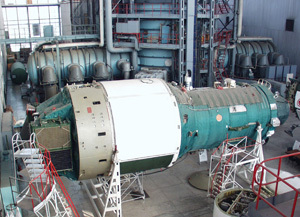 Missile complex with IBM UR-100N U ТТХ (RS-18B) has been in operation till today. Its life has been extended for more than thirty years. At present NPO Mashinostroyenia in cooperation with its subcontractors undertakes efforts on research and development of new strategic missile complexes and advanced warheads. The year of 1965 marked a new era of space exploration by the company and that was the development of the manned rocket and space complex “Almaz” for global observation of the Earth surface from space. Complex Almaz was supposed to be injected into the orbit by UR-500 launch vehicle. Almaz rocket and space complex comprised an orbital manned station, a replenishing vehicle, a reusable re-entry vehicle to deliver the crew to the orbit and bring it back to the Earth, a capsule meant to bring various information carriers to the Earth. All elements of the rocket space complex and its ground infrastructure underwent full scale ground testing and flight trials. 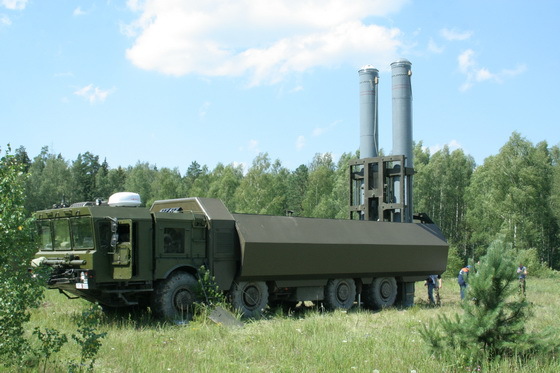 «Almaz» system was designed and developed at the time of UR-100 missiles mass deployment. It was to help in efficient selection of pin-point targets deep inside the enemy's territory including the camouflaged ones. In those days it was believed that only high resolution photography controlled by a human could detect these targets. «Almaz» station was designed as a photo camera platform with focal distance about 10 m and 2 м lens diameter. Photo images from the orbit must be delivered in specials capsules packed by the crew. The capsules were brought to the station by heavy replenishment vehicle. The replenishment vehicle, as a part of reusable re-entry vehicle and functional cargo module, as well as the station itself were put into the orbit by UR-500 К launch vehicle. For testing “Almaz” station and other rockets and space vehicles, the company noticeably augmented its test facilities. 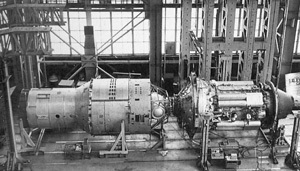 A unique vacuum chamber of 600 cubic meter (VK-600) and thermal structural test facility were put into operation. At the first stage of Almaz space complex development the crew was brought to the station by “Souz” spacecraft. From 1974 to 1977 five flights took place (2 flights – to «Salyut-3» station and 3 flights – to « Salyut -5» station). Astronauts Y.P. Artukhin, P.R. Popovich, B.V. Volynov, V.M. Zholobov, V.V. Gorbatko, Y.N. Glazkov worked on-board the stations. The crews including L.V. Demin, G.V. Saraphanov and V.D. Zudov, V.I. Rozhdestvensky could not dock Soyuz spacecraft with the station because of Soyuz on-board docking system failure. 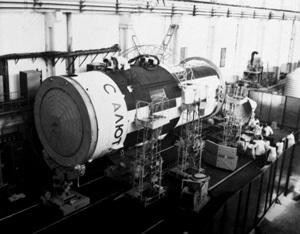 Even earlier, in 1970, several station hulls were brought from the manufacturer to directly the Central Design Bureau of Machine Building – (now the rocket and space complex “Energia” to become scientific stations used under the long-term orbital station program («Salyut», «Salyut -4»), and their versions «Salyut -6», «Salyut -7», complex «Mir», which scientific modules were designed on the basis of the functional and cargo modules of the replenishment vehicle of «Almaz» station and International Space Station. However, by that time it became clear that tasks for military applications might be successfully managed by automatic stations. Besides it turned out that so called "human factor" came very expensive and it complicated the equipment operation. 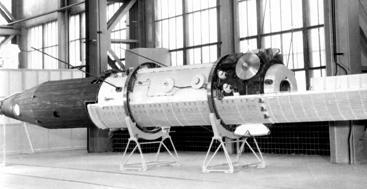 When automatic photo reconnaissance was invented the manned space project “Almaz” was terminated and the hardware was modified to become components of an automatic station with a radar on-board. Under this program in 1976 the development of rocket and space system with Almaz-T automatic orbital station began. The orbital station was equipped with a unique on-board high resolution radar transmitting collected images via a radio channel to a ground data receiving station. Almaz- Т system was meant for complex all-weather round- the- clock observation of the Earth surface to satisfy the requirements of National Defense Ministry, economy and international cooperation. 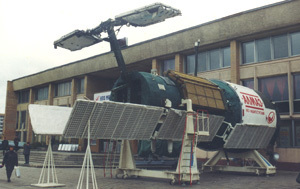 Two automatic stations of this family «Cosmos 1870» (1987- 1989) and «Almaz-1» (1991- 1992) were successfully operated in the orbit. «Almaz-1» station helped to research the ice conditions near Somov motor ship captured by ice in Antarctica during the polar night, and gave recommendations how to escape from this ice trap. Results of this station flight inspired the company to arrange a data processing center in its territory, as well as a vast and frequently used library of the Earth surface radar images. Engineering evolution within last decade made a strong requirement to change dimensions of space equipment. It regards spacecraft and launch vehicles as well. Feeling this demand of the time, NPO Mashinostroyenia came up with the initiative to develop a small spacecraft brought to the orbit by launch vehicles converted from latest versions of UR-100 rockets retiring from military service. So, for the first time in the country there was a suggestion to build a system of small spacecraft for the Earth remote sensing based upon universal space platform «Condor-E». On June 27, 2013 the first in Russia exclusive spacecraft Condor-E with a high resolution radar was launched to the orbit, to meet requirements of a governmental customer. 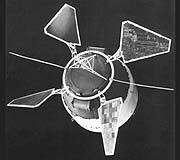 In the period of this spacecraft operation it made radar images to validate compliance with the requirements. And on December 19, 2014 one more successful launch of Strela LV took place, to bring to the orbit the second Condor-E spacecraft in the interest of a foreign customer. All technical designed parameters have been proven. The customer was fully satisfied with quality of images received from the spacecraft. Unique expertise in the field of space and missile technologies and continuous scientific and engineering research allowed to make good progress in cooperation with foreign countries. On the basis of Intergovernmental Agreement with India the Russian-Indian joint venture “BrahMos” was founded and is successfully working now. In November, 2002 President V.V. 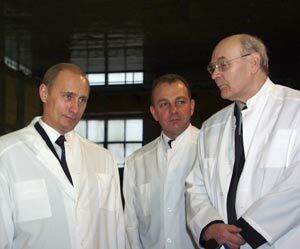 Putin visited the company. He personally had an opportunity to get convinced that all developments of NPO Mashinostroyenia are remarkable for vitality, immensity, innovative and pragmatic nature, real efficiency and great perspectives. Spacecraft and rockets put into operation feature highest quality, reliability and usability. The fact that 6 complexes conceived and developed by the company at different time are now on combat duty. Visit of the Russian President to NPO Mashinostroyenia. Photo of 2002. 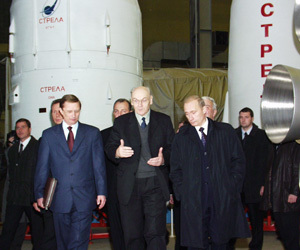 The President Putin is examining Strela launch vehicle. Photo of 2002. Visit of the Russian President D.A. Medvedev to NPO Mashinostroyenia. Photo of 2009. D.A. 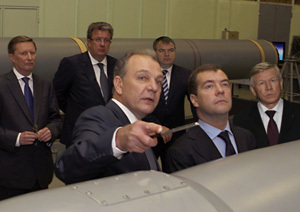 Medvedev is examining BrahMos anti-ship missile. Photo of 2009. The year of 2009 was remarkable because that year NPO Mashinostroyenia Military and Industrial Corporation took its final shape. 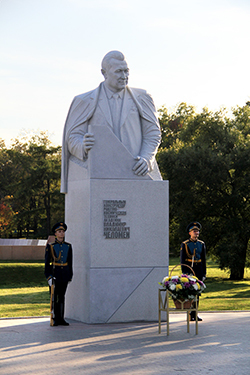 Inauguration of the monument to Academician V.N.Chelomey in Reutov town in 2014. 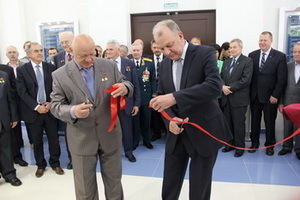 Inauguration of the monument to academician V.N.Chelomey at the Gallery of Space Heroes at Memorial Space Museum in Moscow in 2015. In 2014 there were big festivities held to celebrate the 100-th anniversary of the founder and the first director of the Company, Academician V.N. Chelomey. 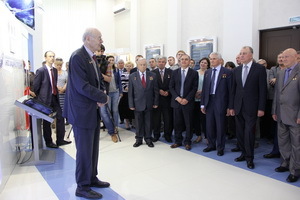 The program included inauguration of the memorial board of V.N.Chelomey at the Moscow State Technical University named after Bauman, some scientific conferences, lections and contests in memory of the academician. The first biographical book and the photo album dedicated to Vladimir Chelomey were issued by this jubilee, as well as a memorable coin, a post stamp and an envelope with his portrait. 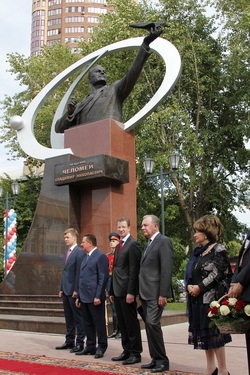 Monuments to Designer General academician V.N.Chelomey were opened in Moscow and Reutov . In 2015 the museum of NPO Mashinostroyenia history and achievements was inaugurated. The legendary astronauts, honorable guests, top managers and veterans of the company took part in the ceremony. Inauguration of the NPO Mashinostroyenia history and achievements museum in the company’s territory in 2015. Today the company's structure comprises Central Design Bureau of Machine Building (CDBMB), pilot machine building factory, subsidiaries, branch offices and auxiliary services. CDBMB includes R&D and design divisions, R&D centers, instrument engineering and test sections, complex test benches and laboratories. The pilot machine building factory is a multi-purpose factory with production workshops and relevant services. The company’s official banner with governmental awards. Photo of 2007. 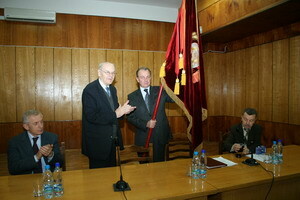 The function on the occasion of granting the status of a Russian science-city to Reutov in 2003. JSC «MIC «NPO Mashinostroyenia» as a city-making enterprise during last 60 years has been noticeably influencing the Reutov-town development. 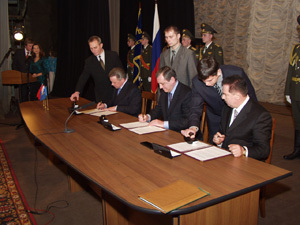 The Russian Presidential Decree of December 29, 2003 awarded Reutov-town the status of a science- city of the Russian Federation. The vast potential of scientists, specialists and workers of the scientific city is comprehensively used to maintain the role of Russia as the world leader in the field of high technologies and to ensure the adequate living standards for the citizens. NPO Mashinostroyenia work has been highly appreciated. For development of state-of-art weapons the company was rewarded with governmental awards such as: Order of Lenin (June 26, 1959), Order of Labour Red Banner (April 28, 1963), Order of Great October Revolution (August 12, 1976). On November 9, 2004 the company’s staff was awarded with the Presidential commendation certificate for the great contribution into development of special equipment and strengthening the defense power of the country. Employees of the company, which directly participated in development and building of new equipment, became Heroes of Socialist Labour, winners of Lenin and State Prizes, the USSR Council of Ministers award, the Russian government award, the state award of the Russian Federation named after USSR Marshal G.K.Zhukov. Some employees were honored with Orders of Lenin, Great October Revolution, Labor Red Banner, Order of People’s Friendship, Order of Workman’s Glory, Badges of Honor. Recently several employees have received various degrees of Order «For services to Fatherland».